Sanal Tinned Heart Cat is a lovely storage tin with delicious cat snacks in it. These treats are free from colourings and sugars. The tin itself looks nice too. 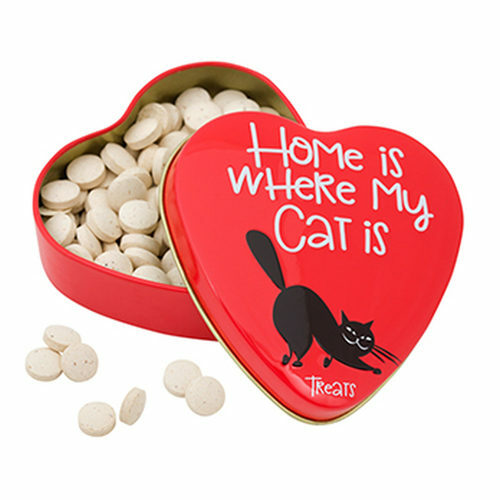 The heart-shaped tin has the fun text ''Home is where my cat is'' on it. Sanal Tinned Heart Cat is a true present for your cat. It contains delicious cat treats that are free from sugar and colourings. What's more, the storage box looks super fun! The red tin, in the shape of a heart and has the lovely text "Home is where my cat is" on it. When your cat has eaten the treats, you can keep using this tin for other cat snacks! Milk and dairy products, yeast, calcium stearate, oils and fats. Have you used Sanal Tinned Heart Cat before? Let us know what you think about this product.